'For most Bible readers Ezekiel is almost a closed book,' writes John Taylor. 'Their knowledge of him extends little further than his mysterious vision of God's chariot-throne, with its wheels within wheels, and the vision of the valley of the dry bones ... In its structure, however, if not in its thought and language, the book of Ezekiel has a basic simplicity, and its orderly framework makes it easy to analyse.' Taylor's commentary offers a portrait of the prophet, places his prophecies within their historical settings, and provides an overview of the book's contents and themes. 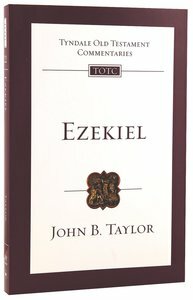 About "Ezekiel (Re-Formatted) (Tyndale Old Testament Commentary Re-issued/revised Series)"
Rt Reverend John B Taylor KCVO was for fifteen years Bishop of St Albans, formerly Vice-Principal of Oak Hill College where he lectured Hebrew and the Old Testament. He has written Ezekiel (Tyndale Old Testament Commentary), Going on: Guidelines for the Newly Confirmed and Seeing is not Believing. He also chairs the Council of Tyndale House, Cambridge.